So far we have seen that quantum physics deals with electromagnetic radiation -- that is to say, light. But at the beginning we said that quantum physics tells us that material things are described by quantum physics. So what happened to matter? Niels Bohr happened to matter. Bohr was a Danish physicist whose parents were both scientists. Apparently young Niels grew up in an atmosphere that was favourable to science. He received his doctorate in 1911 from the University of Copenhagen. One can see just by looking at Niels Bohr's early academic life (though there are many other indicators) that the 'atomic theory' of matter -- that is to say that matter is made up of tiny atoms -- had gone from being scientifically marginalised to being at the heart of physics in a very short time. Bohr's doctoral thesis was concerned with the inadequacy of classical (that is to say, Newtonian) physics for describing the behaviour of matter at the atomic level. In the 19th century, physicists who saw some value in the atomic theory thought of the atom as a tiny undivided and indivisible unit of matter, the smallest possible unit into which something could be broken down. Experiments dealing with the photoelectric effect, along with other observations, strongly suggested that the atom had some internal structure, since particles called 'electrons' were being emitted from them. A model of the atom was described by the British physicist Ernest Rutherford in 1911, and is known as the Solar System model. It is very simple, and is still used to teach elementary atomic structure to school children. An atom consists of a central nucleus. This nucleus is composed of positively charged protons, and electrically uncharged (neutral) neutrons. 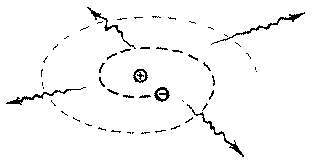 Negatively charged electrons revolve round the nucleus in definite orbits. The orbits themselves can be at any distance from the nucleus. In any atom, the number of protons is equal to the number of electrons, and hence it is electrically neutral. Rutherford used the laws of motion that had been set forward by Sir Isaac Newton to describe the atom. According to Rutherford's description, the electrons of an atom could occupy one of an infinite number of orbits, in accordance with Newton's laws. There were problems with Rutherford's description of the atom from the beginning. Let us find out two drawbacks of Rutherford's theory. Rutherford's description of the atom could not be entirely correct because it did not account for some observations that had already been made. Perhaps the most important of these observations concerned the behaviour of certain gases. These gases at low pressure emit light in a set of discrete bands of the electromagnetic spectrum. This is quite different from the radiation emitted by solids, which is spread evenly across the electromagnetic spectrum. The radiation emissions of these gases were important because they showed that at least under some circumstances, the orbits of the electrons could not be at just any distance from the nucleus, but were confined to discrete distances (or energy states). If the electrons in these gases were free to orbit at any distance, then the light emitted from them would have been spread evenly across the electromagnetic spectrum. Instead, what experimenters saw was that the light from these gases showed a distinct line pattern. That is to say that the light being emitted was only seen in a certain set of wavelengths, with empty spaces in between. These line-spectra were different for each gas, and was found to be the characteristic of its atom. Today, astronomers use line-spectra to detect the elements present in stars. Niels Bohr quickly seized upon this problem and used it to propose a quantised description of the atom. Bohr proposed that while circling the nucleus of the atom, electrons could only occupy certain discrete orbits, that is to say energy levels . Bohr used Max Planck's equations describing quanta of radiation to determine what these discrete orbits would have to be. As long as electrons stay in these energy levels, they are stable. Further, Bohr said electrons give or take energy only when they change their energy levels. If they move up, they take energy (say from light), and if they move down, they release energy. This energy itself is released in discrete packets called photons, which were introduced in the previous chapter. Furthermore, Bohr also said that an electron which is not in its native energy level (in other words, which has been excited to a higher energy level) always has to fall back to its original, stable level. Bohr interpreted the lines in the spectra of gases as formed by the transitions of electrons to and from various energy-levels. This has been verified thoroughly with the hydrogen atom, and found to be correct. Bohr's formulae agreed excellently with observed line positions. Imagine that you are taking a walking along a beach. As you walk along, you see a sand-castle that someone has built. As you get closer to the sand castle, you discover that you can only stand three meters, two meters, or one meter from the sand castle. You cannot stand at one and a half meters, nor can you stand at two and three quarters of a meter from the sand castle. No matter how hard you try, some mysterious force keeps you at one of those three distances. In everyday life such a situation is absurdly impossible. In the physics of the very small, it is a necessity. This description in which electrons can only occupy certain orbits is called the shell model of the atom, because Bohr described the possible orbits of the electrons as orbitals or shells. When an atom of a gas released energy, an electron would move down to a lower orbit (requiring less energy), and when an atom acquired energy, an electron would move up to a higher energy level. But these orbits or shells were discrete, like the distances from the sand castle. The orbits were not a smooth, continuous series of possibilities as one finds in the everyday world, but rather a set of distinct states separated from each other, much like the separation of the quanta of electromagnetic radiation that Planck had discovered. This caused the distinct lines in the spectrum. For the first time, quantum physics had been applied to matter. 1. Extending the same analogy, can we say the solar system is also unstable? Do planets going round the Sun also lose energy and spiral into the Sun in the same manner?